In-line sight glass type LKGG-1 and LKGL-1 is used in pipelines to allow visual observation of product flow. Inline sight glass designed for providing visual identification of product flow. Polysulfone Lens material. 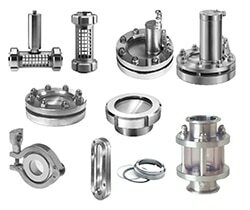 (NO GLASS) It can be effectively sanitized with standard CIP techniques and cleaning agents, remaining tough and durable in water, steam and chemically harsh environments. High-performance thermoplastic resin is noted for its ability to resist deformation under load in a broad range of temperature and environmental conditions. Sight glass, type LKS 105, is designed for pressureless storage tanks and should be installed above liquid level. The sight glass is welded into tanks or containers to facilitate inspection of product, level, processing, cleaning ect.